I am so grateful to receive a Heart Transplant. 26 years ago, my heart was damaged by a virus and my family and I were shocked to learn I needed a transplant. When I heard the news, I decided right then to make the very best of this gift and to take good care of it. I have lived with this heart 26 years and still tell everyone I meet how blessed I am. Having a transplant has enabled me to meet my 26 grandchildren and 23 great-grandchildren! It also gave me many great years with my husband until he passed away from cancer. He had taken such good care of me, it was my pleasure to give back to him. 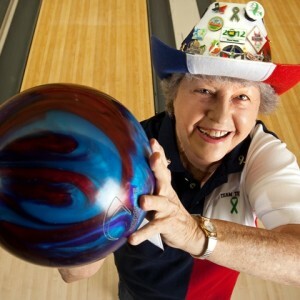 And, not only did I learn to bowl for fun and exercise, I’ve been the youth bowling coach at center where I go for the past 15 years. It’s been exciting teaching the kids and having the chance to watch them grow up. I have gone 9 times to the Transplant Games and have even won some medals for our state. Living on social security, I do lots of fundraising to help raise money to attend – I’ve held garage sales, made crochet afghans and raffled them off, had bake sales, you name it! Attending the games and getting to meet so many people is worth it. Talking to other transplant recipients is really rewarding. Meeting me seems to give new transplant recipients hope and I get excited hearing about someone who has lived with their transplant longer than I have. It is so wonderful talking to people and encouraging them to become donors through my volunteering with LifeGift. Sometimes hearing my story is enough to get someone to sign up, but I also like answering their questions to put their mind at ease. I even get to tell people that I’m a living donor! Back when I had my transplant, they asked me if I wanted to donate my old heart. I didn’t realize that even though the rest of the heart had been damaged, it still had two perfectly good valves that could be donated to help others. Staying busy isn’t just good for my heart, it makes me feel useful. And, every day for 26 years, it honors the gift my donor gave me. To receive a transplant gift is a blessing. You are very LUCKY to receive that gift of longer life. Thank God people are open minded enough to donate a family members organs. My son received a liver at age 11 and the 15 yr old girl who died and her family donated EVERYONE of them are still our hero’s. We’ve never met but they will be loved by us forever!